Are you interested in Playa Vista new construction? 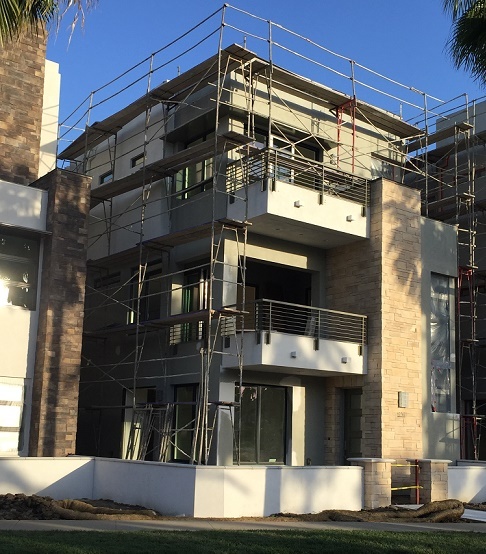 This comprehensive guide to buying new construction in Playa Vista walks you through the process, preparing you for what to expect each step of the way. How do I know the process? As a real estate agent focusing on Playa Vista, for both resale and new construction, I have assisted 10+ clients secure and close their new construction homes over the past year. In doing so, I’ve had the opportunity to work with each of the builders: Tri-Pointe, KB Homes and Brookfield Residential. And from these transactions, I have learned a ton about buying new construction and most importantly, how to best help my clients from start to finish. This guide is an in-depth recap of what my clients and I have experienced while buying new construction in Playa Vista. After walking through the models and deciding you could see yourself living in one of these amazing homes, getting on the interest list is the first step in the process. Even if you haven’t 100% made up your mind on a property it is smart to join the interest list so you don’t lose time in the process. It is all about securing your place in line. In this new construction market there are more interested buyers than there are properties. And, the higher up on the list you are the better chance you have of getting the location/plan that works best for you. Every builder is different but the majority of builders require you to prequalify through their preferred lender to be approved for the interest list. This does not mean you have to use their lender to move forward with the transaction. More about pre-approvals and working with the preferred lenders below. I hear this question often. It is true you don’t have to use a Realtor to buy new construction. It is also true having an experienced advocate consult you along the way does not change the price of the home or cost you money. Having a professional on your side can help you save money, time and energy. Most builders cooperate with agents by offering to pay a referral commission to the agent for representing you. To include your real estate agent, you will want to have them with you at your first visit to the builder. Builders are strict about this policy. First, you should know you have the ability to pick the lender of your choice. Although, to get on the interest list most builders require you to be pre-approved by one of their preferred lenders. If you like the preferred lender and the rates are competitive there may also be perks available for working with them. Builders can offer incentives to buyers if they use the preferred lender. If offered, I’ve generally seen between $5,000 and $10,000 that you’ll get back in the form of a credit toward closing costs or upgrades from the design studio. Once you are pre-approved you will be added to the interest list. Missed Out on the Latest Release? What happens when your name doesn’t come up on the list? Before every release have your Realtor do some digging for you. This will give you a picture of not only where you are on the list but your chances for getting your 1st or 2nd choice location. The buyers ahead of you may be holding out for 1 specific unit, in fact we see groups of people focused on one lot or floor level. This opens up your chances even if you are further down in priority. It’s not over yet… If all the units you like are gone there is still a chance. Homes fall out of escrow for lots of reasons; financing, job changes, the list goes on and on… Have your Realtor stay in touch with the builder’s sales office to let them know you are motivated and to see if there are any properties that could potentially fall out of escrow. While you’re waiting keep the home search alive by working with your agent and touring homes that could be a good fit. Each release will offer different lot locations for the plan you like. The better lots (view, corner, quiet area, south facing, etc…) often have lot premiums attached to them. Make sure you visit the site with your Realtor and the builder’s sales agent. Figure out the direction the home is facing and what will be built nearby prior to making a decision. Ask a ton questions. If there is a dirt lot across the street find out what’s going to be built. What kind of landscaping is going in around the property? Will trees block the views? What about traffic? Keep asking questions until you are completely educated on the location. If you would like to secure a property, either after being called from the interest list or by holding one that has already been released, you will need to make a reservation. A reservation form is filled out and a check for the earnest money deposit is given. This deposit check can range from $25,000 up to 3% of the purchase price. Once you hand over a check and sign for the reservation the home is put on hold for you and a contract signing date is set-up. The check will not be cashed until the contract is signed and escrow is opened. Normally, a builder will require a buyer signs their contract within 3 days of reserving the property. If you change your mind prior to signing, then the reservation is cancelled and the check is returned. In a typical resale contract contingencies are built in to protect the buyer and the seller. Resale properties offer contingencies for inspections, loan, appraisal, disclosures, HOA documents and more. New construction is different. When buying new construction there is usually only one contingency which is the loan contingency. You’ll find some builders don’t offer a loan contingency. If that is the case, once you are preapproved and your contract is signed, then the deposit becomes hard. If the builder has a 30 day loan contingency then the lender needs to provide a fully underwritten conditional approval to the builder within 30 days. Ask your Realtor to find out exactly what contingency period is offered and what is necessary during that timeframe. In the majority of new construction purchases, the loan contingency is up well before the home is completed. The appraisal is done near the end of the escrow so generally the appraisal is not a contingency of the sale. One of the main differences with a new construction escrow is the length of time the average sale takes. Most of the time when you are purchasing new construction, the home has not yet been completed or even started. Depending on the stage of the home when you get into escrow it can take 30 days to 6 months plus before its time to move in. Make sure you are prepared for this long escrow and the potential delays that can occur. The last thing you want is to end up between homes for the weeks leading up to closing. If you aren’t prepared, these delays can be frustrating and can leave you with a bad taste in your mouth regarding your purchase. The escrow period can really be a fun time. Set up visits as often as you’d like to see your property during the process. Take photos of your home being built and start planning your upgrades, furniture, window coverings, etc. Make sure to always speak with your Realtor or the sales office regarding okay times to visit and when you may need to wear a hard hat. Don’t expect everything to be perfect each visit. You are visiting a work in progress and items may not be installed perfectly when first placed. The fun part! This is the biggest difference between purchasing a new home and purchasing a resale property. If you secure your home early enough (before design deadlines) then you get to design almost every aspect of your homes interior! Generally the design studio will call you within a few days of signing the contract to set up an appointment. This design center appointment will consist of choosing flooring, cabinetry, countertops, backsplash, appliances, electrical, lighting and much more. Ask your design consultant questions, take photos, think about what furniture you will be adding and take time to think about your decisions. Research, research and research. Websites like houzz.com or using pinterest are wonderful ways to gather your ideas. Keep in mind that model homes generally have a huge amount of upgrades which creates a large difference from the base price of the unit. Make sure to factor in the cost of upgrades when determining whether the home is the right fit for you. Timing the completion of new construction can be a bit challenging. We put together another article with strategies our clients have used to help them bridge the gap from their current home to their new construction move-in date. Each step of the build process will be inspected not only by the foreman in charge of your project, but also by the local building inspector who should be keeping an eye on things to be sure the local building codes are being met. If you do see problems, be sure to bring them to the attention of your Agent who will assist you in working out any issues with the builder. Also, before or after your final walk through you have the option to hire your own inspector. You are almost there! Just before closing, the builder will schedule a final walk through. This is the time to break out your magnifying glasses and fine tooth comb. Note everything and anything that may not be perfect. Test all cabinet doors, look for paint imperfections, test patio doors and locks, make sure all of the lights work, etc. If you find something (and you will) they will mark the area to fix prior to closing. This is also the time when the builder will go over how your appliances and smart home features work. They will also go through the warranty and who to call if/when issues arise. Take notes and ask questions. The builder’s warranty that comes with your purchase covers pretty much everything for the first year and then some items are covered for up to 10 years . Speak with your Realtor and the builder about the specific warranty that comes with your new home. It’s time to plan your move and put the champagne on ice! First, check with your HOA to see if there are any move-in policies. You may be required to put down a security deposit and/or get approval to move-in on a specific day. Planning to Lease Your New Playa Vista Home? Within Playa Vista’s new construction each builder has their own policy on when you can lease your property. Skylar and Asher, built by KB Homes, and Woodson, built by Tri Pointe Homes, do not have any restrictions. Brookfield Residential which built Camden and Trevion require one year of ownership prior to allowing properties to be leased. The remaining communities to be built will be completed by Brookfield Residential. At this point we don’t know what their policy will be, but we suspect there will be a 1 year waiting period. As of today, May 15th, 2015, Playa Vista’s new construction is nearly sold out (more to come at the end of the year). Trevion, Asher and Woodson, all single family home communities, have been sold out since the beginning of the year. Camden and Skylar, which are both condo communities, have a bit of inventory left. For these two, there will be more condos released over the next couple months and it is still possible to secure one of these amazing homes. For the remainder of Playa Vista’s new home building, Brookfield Residential will be the sole developer. Brookfield, in June, released the names, descriptions and anticitpated price ranges of four new communitties: Seabluff Flats, Everly, Marlowe and Jewel. Between the four we understand there will be 99 single family residences and 75 condos built over the next 2 years. The single family homes are expected to be based upon the designs/layouts of Woodson, Asher and Trevion which were sold during 2014 and 2015. You can find more information about the new homes along with updates as they happen on the following pages: Seabluff Flats, Everly, Marlowe, Jewel. If you’ve made it this far I sure hope I was able to provide some useful information along the way. Let me know if you have any questions about the new home buying process or if you would like help navigating the Playa Vista real estate market. Best of luck house hunting! The above is a recount of my experiences working with clients to buy new construction in Playa Vista. Each builder is different and their policies and procedures are subject to change. The key is asking questions until you feel you have complete understanding of each aspect of your purchase.